HOUSTON, JULY 9, 2015 – In a move certain to shock and delight North American anime fans, Sentai Filmworks is proud to announce the acquisition of the acclaimed murder mystery series Higurashi – When They Cry, as well as the previously unreleased sequel series Higurashi no Naku koro ni KAI and the companion Original Video Animation series Higurashi no Haku koro ni REI. 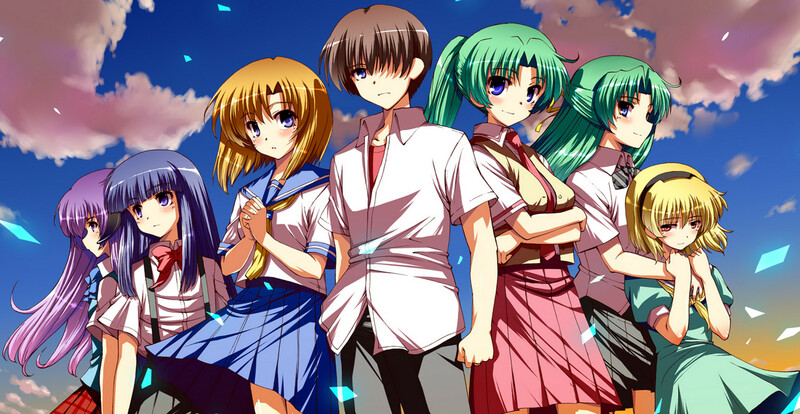 Noted for their uncanny and unsettling use of traditionally cute and charming imagery to tell a story of blood curdling horror, the HIGURASHI series begins as a young transfer student moves to the tiny and picturesque rural town of Hinamizawa. It is only after he settles in and starts to make friends, however, that he begins to learn some of the secrets that the townspeople have kept hidden from the outside world. Including the fact that every year, after a popular festival, someone is found murdered. Based on a hit series of Visual Novels by Seventh Expansion (Okamikakushi - Masque of the Wolf, Umineko), animation production for all three series was supervised by Studio Deen (Fate/stay Night, You’re Under Arrest, Maison Ikkoku, Hetalia) Higurashi – When They Cry and Higurashi no Naku koro ni KAI, each running for 26 episodes, were directed by one of anime’s most noted female directors, Chiaki Kon (Devils & Realist, Golden Time). Direction for the five episode Higurashi no Naku koro ni REI and Series Composition duties for all three series was handled by Toshifumi Kawase (Beyblade, Giant Killing,) while music for all three series was composed by the prolific Kenji Kawai (Ghost In the Shell, Patlabor, Fate/stay Night, Ranma ½). Dates and other details for DVD, Blu-ray and digital distribution of all three series have not yet been established at this time, but all information regarding these releases will be made available in the near future. Sentai Filmworks curates one of largest and most beloved anime and genre programming libraries, containing thousands of hours of content released across traditional and digital media platforms. With hit series that include Parasyte –the maxim–, Log Horizon, High School of the Dead, Persona 4: The Animation, and Akame ga Kill!, Sentai’s catalogue continues to grow with new favorites such as MY love STORY!! and Is it Wrong to Try to Pick Up Girls in a Dungeon? Visit www.sentaifilmworks.com for more information.